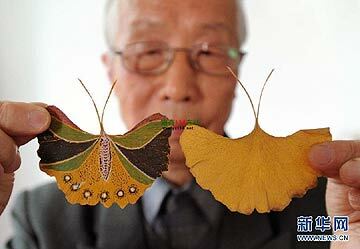 Handmade butterfly created by 81-year-old Gu Houxin with a leaf of a Ginkgo tree in Suzhou, east China's Jiangsu Province. Gu has so far made over 700 such butterflies by painting coloured patterns on Ginkgo leaves. Update of my blog post of July 20, 2007.